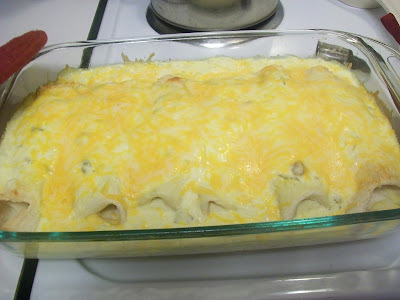 Little Mrs. Married: Creamy Chicken Enchiladas! *see bottom of recipe for notes on these ingredients. 1. In a large mixing bowl, beat the cream cheese, water, onion powder, cumin, salt & pepper until smooth. Stir in chicken. 2. Place 1/2 cup down the center of each tortilla. Roll up & place seam side down in a greased baking dish. 3. In a bowl, combine the cream of chicken soup, sour cream, milk & green chilies; pour over the enchiladas. 4. Bake, uncovered, at 350 for 30-40 minutes or until heated through. Sprinkle with the cheese & bake 5 minutes longer or until cheese is melted. *I bought a rotisserie & just shredded all the white meat chicken off. It was the perfect amount. *I just noticed while typing this that the original recipe said 2 cans of cream of chicken! Oops! That was actually ok though. Probably should've halved the remaining ingredients since i only had 6 tortillas in 1 pan (instead of 10 in 2 pans like the original recipe had). *Recipe says cheddar. I used a mix of monterrey jack & colby, because that is what i had. It was delish! Haha! I love it, Melissa! I was so excited about the recipe and I saw cumin and literally said "Yuck" out loud and shivered. :) sounds delicious, other than that one nasty little spice haha!! I will definitely be trying these!!! HAHA - you could do that in chili too ya know. Maybe replace it w/ taco seasoning or something...or don't replace it at all! it'd be fine!